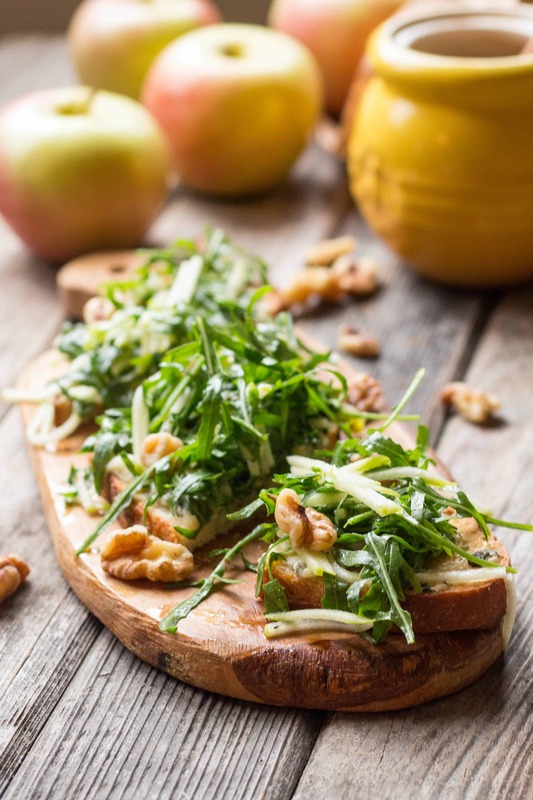 This recipe for blue cheese tartines with apples and arugula make the perfect fall lunch or snack. Tangy blue cheese, crisp apples, walnuts, and honey! Blue cheese is one of those polarizing ingredients that I happen to adore. It’s stinky, creamy, tangy, and sometimes even a little bit sweet. I love it in salads, on pizzas, baked into savory-sweet tarts, on cheese plates and with fruit. As of lately, I can’t get enough of it melted onto a piece of toasted bread and topped with a crisp apple and arugula salad. Let’s call it a tartine to make it sound extra adorable. Side note: I loved revisiting this post just now after spending a week in Spain eating all the tomato bread I could get my hands on. If you’re one of the many folks who gag at the mere thought of smelly, moldy blue cheese (yum), you can totally swap it out for another cheese if you wish. Brie, goat, and sharp cheddar would be especially tasty. What are your thoughts on blue cheese? Love it or hate it? Leave a comment and let me know! Crumble the blue cheese on both pieces of bread, then place them in the toaster oven until the cheese is melted and the bread is crisp, about 5 minutes. While the bread toasts, make the salad. 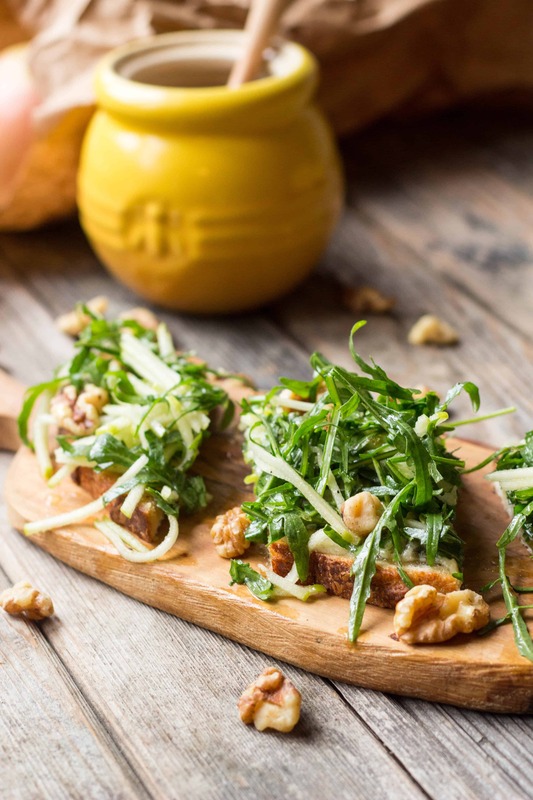 Combine the arugula, julienned apple and walnuts in a bowl and season with salt and pepper. Squeeze the lemon over top and drizzle with olive oil, then use clean hands to toss until combined. Taste for seasoning and adjust as needed. Remove the blue cheese toasts from the oven and drizzle each with about one tablespoon of honey (use more or less depending on taste). Divide the salad and arrange over top of the toasts, then cut into 3-4 pieces. Serve immediately. Who does not like blue cheese?! These tartines have all the best complimenting flavors with it and they could slow down my intake of straight up Maytag blue. Best wine snack. Right? I adore blue, but I come across soooo many people who despise it! Maytag is definitely one of my favs. SO tangy and creamy! We ate a lot of cabrales in Spain which is probably the strongest tasting blue I’ve ever had. Mmmm… still dreaming about it (and the wine). Coley – you are truly a hoot! 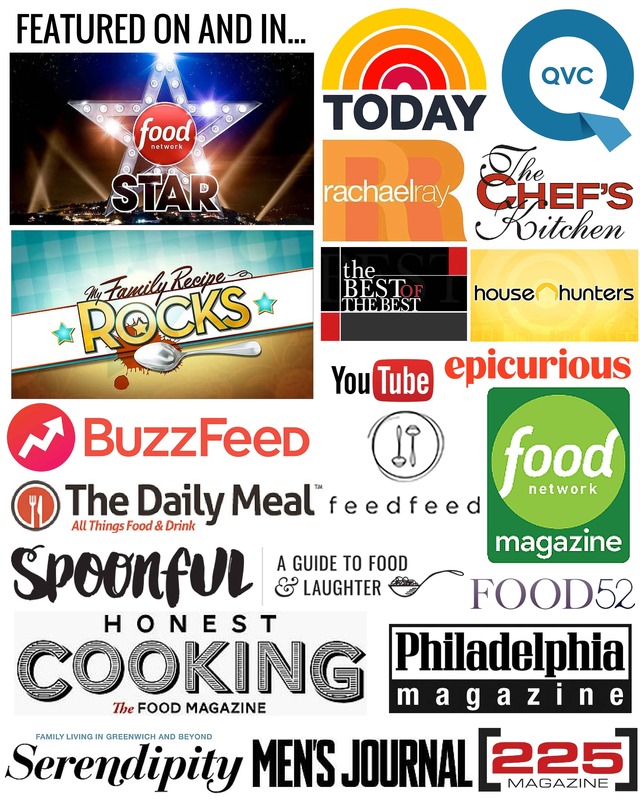 Love your writing style and the fact that you’ve become one of the ‘funnest’ food bloggers on the Internet today. All of the island is proud of you and what you have accomplished since Network Stars. And I agree with Danielle – you would have to be somewhat crazy not to just love a good quality sweet, tangy and slightly stinky bleu or Roquefort cheese (although I will always be partial to Stilton). I wish that you had told your readers to let it come up to room temp first ’cause that makes it even more blue than bleu – but even right out of the fridge – those toasts or tartines would be the perfect late afternoon nosh with a glass of crisp Sauternes or a not too sweet Riesling. Especially sitting on the porch on a Chamber of Commerce afternoon like the one we’re having right now. Since I have all of the ingredients in the fridge – we just may fire up the fire pit and do this tonight. Thanks, girl. .
Hey Bruno! I haven’t heard from ya in a while, so it’s always nice to see your name pop up. You’re right on with the sauternes or off-dry resiling to pair with this! I love stilton too. There aren’t many cheeses I don’t love. It actually doesn’t matter all that much what temp the cheese is when you start since it gets melted in the toaster oven. This is my current favorite snack. I hope you tried it last night (and turned off the chamber meeting lol). Report back! I ADORE blue cheese, it is one of my favorite! This tartine is so appealing to me, having all the ingredients I like! And your video is well done and adorable! Great job! Thanks, love! You must give these tartines a try, they’re so simple but sooo good!! Love this recipe! Looks absolutely delicious and so easy to make.